This poster was created for the Music and Theatre Department of Fort Hays State University. 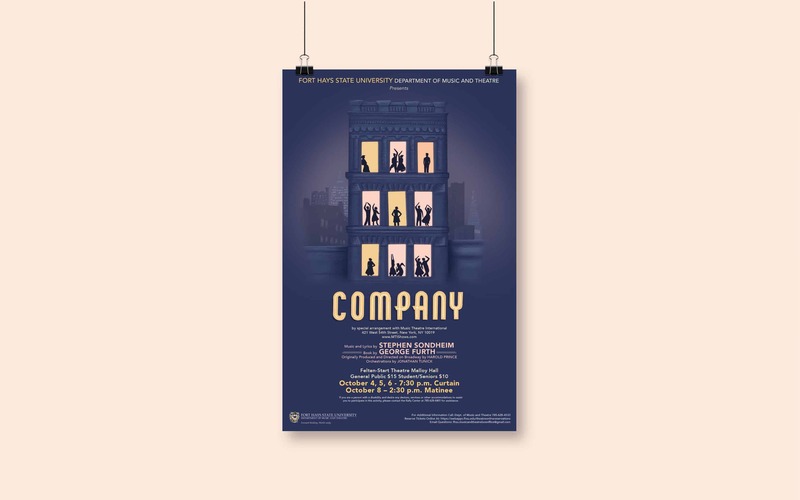 Company is a musical set in New York City and revolves around a “single” man who is unable to commit to a steady relationship, let alone marriage. The poster highlights the main character, five married couples who are his best friends, and his three girlfriends of the story through color and playfulness. Initially, the client sent over a mood board of several examples from other Company musical posters and asked me to put my own spin on it. After researching what the musical was about I knew I wanted to illustrate a night scene of a traditional city apartment building. I also knew I wanted to include silhouettes of each main character in the buildings’ windows. From there I started researching styles of NYC buildings and theatre signage. The illustration was my first attempt at creating a finished piece for a client in Procreate on the iPad Pro. After finishing the illustration I sent my file over to Adobe Photoshop to clean it up. The finished layout for the poster and a social media image was designed in Adobe Illustrator. I had a great response from the client. She came straight over to our office after she received the rough draft to tell me how much she loved the illustration! Through this project, I discovered my passion for illustration and incorporating it into my design work. For more of my work visit my website at https://kelseykahrs.weebly.com/.